NEW DELHI, India. The Sunday Indian. August 23, 2012. (English) by Amir Moin. -In what seems to be a step towards the evolution of the edutainment market in India, Mexico-based edutainment chain KidZania is all set to launch its India operations through a franchisee model early next year. The first campus will come up in Mumbai. 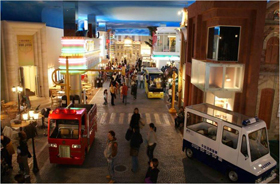 Delhi and Bangalore will subsequently follow.For the uninitiated, KidZania is a park in the form of a city replica. The establishments inside the city include everything from a proper functioning government, universities, grocery stores and media houses. But here’s the twist. The city is for kids between 4-14 years of age. The children go inside and have the option of becoming a consumer or working to earn money. It is a platform, which not just entertains and educates but also empowers children at the same time. Some of the most well known brands globally have a presence inside the city. There’s HSBC Bank, Swatch, HP, Sony, McDonald’s et al. The most interesting bit about this concept is how it provides an incremental marketing opportunity for brands. They don’t have to worry about advertising to kids anymore. Instead, children visiting KidZania often will automatically grow up to identify with the brands they’ve seen and experienced inside the city and potentially end up being loyal customers in the future. In an exclusive conversation with 4Ps B&M, Viraj Jit Singh, CMO, KidZania India, shares that KidZania is about educating, empowering and entertaining children through ‘role plays’, and brands happen to be a key component of their model because they make the entire exercise more realistic and life-like. “We work in conjunction with industry partners to build realism in the experience, making it authentic, immersive and rewarding for kids. Each establishment is sponsored by its counterpart brand in the real world. For instance, Air Asia sponsors the airline activity in three of our centres while HSBC sponsors the banking activity in Dubai,” adds Viraj. In India, KidZania will be seeing the light of day soon because of an eventful trip that Bollywood star Shah Rukh Khan took to KidZania, Dubai along with his kids. Once inside, he was absolutely impressed with the depth of the model and the way it was adding value to every single child in the park. He realised that there was a huge void in India, which KidZania could fill in. With that in mind, he decided to bring the edutainment major to India. While Khan has a 26 pc stake in the venture, the rest is owned by the Singapore-based KidZ Inc.
KidZania has turned the concept of edutainment over its head. It has merged elements of education, entertainment, empowerment and CSR on one hand while providing an incremental marketing platform for brands on the other hand. It is a concept that hasn’t yet been tested in India, since theme parks are mostly about joyrides, games, shopping and food here. Considering that parents are particularly concerned about giving their children the right kind of exposure in today’s media rich environment, the concept has definite relevance for any market. It is important for KidZania to price it right, though; since it has to give a value added offering and also attract the right target audience. Attracting too many may diminish the experience and attracting too little may not get the desired numbers.